Schultz & Dooley, et al. This article is intended as an adjunct to the on-line Schultz & Dooley Character Stein Catalog in the Beer Stein Library. Various links provided herein will take the reader directly to examples provided in the catalog. After viewing a catalog example, use the “Back” button on your Internet browser to return to the article. Growing up in New York in the 1950s, I was one of the many television viewers in the Northeast who were introduced to the West End Brewing Company (WEBCO) “spokesmugs,” Schultz and Dooley, through a series of award-winning commercials for Utica Club beer. Unlike the ceramic Schultz and Dooley character steins now marketed by WEBCO, the original TV characters were made of wood. The renowned puppeteer Bill Baird is credited with bringing the steins to life, along with comedian Jonathan Winters, who supplied their voices, complete with German and Irish accents. 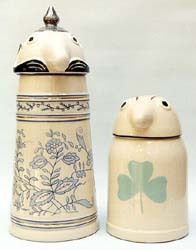 In 1959, trading on the popularity of the Schultz and Dooley television commercials, WEBCO contracted with Schmetzer Inc., a Liverpool, New York importer, to import 5,000 ceramic sets of the now-famous duo from KING-Werk (Würfel & Müller GmbH) a German stein manufacturer located in Höhr-Grenzhausen. For the most part, the original steins were given away as promotional items to various dealers and distributors. Some, however, were apparently offered for sale to individuals at $9.95 a pair. The original Schultz and Dooley (Figure 1) are easy to recognize by the markings “59-CSM” in blue lettering on Schultz and “59-CDM” in green on Dooley, printed below the handles, along with a West End Brewing Company copyright statement. (Figure 2) The steins are similarly printed on the bottom, but with the additional markings © WEBCO and MADE IN GERMANY, in large letters, pressed into the clay. Recent auctions have yielded prices in the $250 to $325 range for the pair. However, with regard to current Schultz and Dooley pricing, it is important to note that the whole in this case is worth far more than the sum of the parts. Neither Schultz nor Dooley have any significant market value except as part of a matched pair. This is true with respect to both the originals and any of several later versions. Whether bidding on them at auction or making a purchase from a dealer, buyers are well-advised to stay away from individual pieces unless there is some assurance that a match can be obtained. As part of the agreement with the importer, Schmetzer was given permission to sell an identical set of Schultz and Dooley steins through various retail outlets in the Northeast. It is my understanding that the deal provided Schmetzer with the ability to market one pair of steins for every two shipped to WEBCO. The markings on these steins varied considerably over the term of the Schmetzer contract. One long-term WEBCO employee claims to have observed as many as ten variations. I’ve seen several examples from this period myself, including one with no WEBCO copyright mark, but with the word “ORIGINAL” pressed into the bottom and also displaying the printed words “WESTERN GERMANY.” A fairly commonly seen variety has the printed words SCHMETZER INC. SELECTED IMPORTS NEW YORK, along with the impressed WEBCO copyright mark. The KING-Werk production run apparently provided sufficient stock to last until 1972, when manufacturing was taken over by Ceramarte, a Brazilian stein maker. Between 1972 and 1982, Ceramarte produced another 7,000 sets. These steins were visually distinguishable from those produced by KING in three significant respects (see Figure 3). First, the point on Schultz’s head was changed from silver to gold; second, Schultz’s body color was changed from off-white to white, while Dooley’s got somewhat darker; and third, the bottom markings indicate that the manufacturer was Ceramarte and that the steins were made in Brazil. Additionally, there were some minor variations in the decoration and the thumblifts. A HREF="../item.asp?ItemNum=sd-103"
It was also during this period that WEBCO introduced the first two in a continuing series of Schultz and Dooley companion characters — Officer Sudds, whose debut was in 1973, and The Countess, introduced in 1978. These two steins had production runs of 7,000 and 6,000, respectively, and are distinguishable from later versions principally by the Ceramarte markings on the bottom. Both Officer Sudds and the Countess were based on characters that co-starred with Schultz and Dooley in the Utica Club television commercials, as did almost all of the subsequent additions to the series produced through 1995. In 1982, WEBCO parted company with Ceramarte and once again began importing steins from Germany. The manufacturer was S.P. Gerz GmbH and the importer was Made in Europe Imports (MIE). Schultz’s point reverted to silver and the Schultz and Dooley body colors were returned to off-white. The decoration again changed slightly (the changes are most pronounced on Schultz), as did the shape of the thumblifts. In that same year, Gerz also began producing the original version of the third Schultz and Dooley companion stein, Farmer Mugee. A total of 7,734 original Farmer Mugee steins were manufactured and are distinguishable, along with the other steins from the MIE period, by the bottom markings which include a Made in Europe Imports logo and WEBCO copyright (Figure 4 – left). Those markings were also applied to 6,765 sets of Schultz and Dooley, as well as 4,998 follow-up versions of Officer Sudds and 3,032 of the Countess. During the 1984-85 timeframe, the role of importer was transferred to Trans World Marketing (TWM), an offshoot of MIE, and the steins produced during this period all received a TWM logo as part of the bottom markings (Figure 4 – right). Gerz continued to handle the manufacturing chores. It is worth noting that, while none of the steins produced during the TWM era are first editions, the quantities of steins produced with the TWM mark make them among the most rare, although probably not the most collectable. Production of WEBCO steins bearing the TWM mark are limited to: Schultz and Dooley – 4,524; Officer Sudds – 1,980; Countess – 744; and Farmer Mugee – 3,864. Copies of Farmer Mugee from this period are slightly larger than the originals and vary somewhat in the color scheme of his bandana. Interestingly, he reverted to the original size and coloration in later production runs. Beginning in 1985, WEBCO saw fit to cut out the middleman and started importing Schultz, Dooley and friends directly from Gerz. Between 1985 and 1992 Schultz and Dooley steins were marked on the bottom as shown in Figure 5. The series thumblifts were upgraded during this timeframe from a relatively plain and flat “flared finger” design to the more ornate fleur-de-lis pattern, which continued to be applied throughout the Gerz production years. In 1986, WEBCO introduced Schultz and Dooley companion number four, an oriental character by the name of U Cee. All 10,373 copies of U Cee made during this period bear the same bottom markings applied to Schultz and Dooley. Between 1990 and 1992, a new companion stein was added annually, initially as a first edition and then with the standard bottom markings for that timeframe. The 1990 character was Old Man Stein, which had a 1st Edition of 5,000 pieces. 1991 saw the introduction of Cousin Emma, with a first edition of 7,000. In 1992, WEBCO parted with tradition by introducing Fireman Fritz, the first companion stein that did not have a role in the original Schultz and Dooley TV commercials. His creation was designed to coincide with a firefighters convention being held that year in upstate New York. In addition to 10,000 “1st Edition” copies, 2,000 identical “Special Edition” steins were produced and sold directly to the firefighters. Between 1993 and 1995, WEBCO introduced what were believed at that time to be the final three characters that had appeared with Schultz and Dooley in the early TV commercials — Sir Oliver Wendell Foams in 1993, Uncle Rudolph in 1994, and the Moon Man in 1995 — all three in 1st Editions of 10,000. The Moon Man was the first character to display a revised bottom mark, shown in Figure 6, noting the relationship with the F.X. Matt Brewing Co.
With the issuance of the Moon Man, WEBCO seemed to have finally run out of Schultz and Dooley TV characters, and many assumed that the series was, in effect, “complete.” However, rather than let this popular series of character steins simply fade into history, a decision was made to try and keep a good thing going. June of 1996 saw the introduction of Mulligan McBrew, a golf duffer “ready for the green with his bag, golf ball and tee, and his lucky sun visor,” followed in October of that same year by The Bartender, sporting a “red striped vest, bar cloth and frosty mug of U.C.,” and in mid-1997 by Nurse Polly, with her “well-equipped medical apron.” These three steins were the first in a new line of what WEBCO was then calling “Lifestyle” characters, and they appeared to be every bit as popular with collectors as the original TV players. In part, this can be credited to the fact that the new steins were designed to appeal to people engaged in the depicted occupations and leisure activities. What golfer, bartender or nurse wouldn’t be attracted by one of the three. Later in 1997, the folks at WEBCO “discovered” another character from the TV commercials that had somehow been previously overlooked. For those who had stopped collecting the series when they ran out of TV characters, the 12½" tall Giant, provided at least one more member of the original Schultz & Dooley players. The years 1998 and 1999 saw the introduction of four more characters designed to appeal to wide audiences, including: The Graduate, complete with tassel and diploma, and just in time for June 1998 graduations; UC Runner, a jogger whose sweatshirt design celebrates the 40th anniversary of the Schultz & Dooley series; and Max Millennium, a two-sided stein with an elderly gentleman (1999) on one side and baby (2000) on the other. Max Millennium was the final WEBCO stein to be made by long-time producer S.P. Gerz. After a steinmaking history that spanned more than a century, Gerz closed its doors for the final time in late 1999. The demise of Gerz came as no surprise to industry observers, and WEBCO barely skipped a beat before selecting their old partners at KING-Werk to take over production chores. It will be remembered that KING produced the original Schultz & Dooley steins between 1959 and 1972. With Gerz out of the picture, KING had gained the title of “Germany’s largest beer stein producer” and was therefore the natural successor. The takeover of production chores by KING also served as the occasion for another revision in the standard bottom markings (Figure 7), which added a newly established web site address to the previous information. That mark, of course, was also applied to characters first produced by other manufacturers, but later made by KING, to distinguish the more recent copies from earlier versions. Initial production runs also carried the words “First Edition” as the top line in the mark. The new issues manufactured by KING followed the post-1997 pattern of creating characters likely to appeal to broad audiences based on connections to occupational or leisure activities. In the year 2000, KING produced Rod Lager, a sport fisherman who came complete with “rod, reel, basket and lucky fly hat,” and Wanda Goblet, a blue-eyed waitress in a grey uniform with hot pink trim. These were followed in 2001 by Slugger Hopps, a baseball player in the pinstriped uniform of the Schultz & Dooley team, and Mailman Mike, a letter carrier toting an overflowing mailbag. The year 2002 saw the introduction of Biker Buzz, with his helmet, goggles and blue-trimmed leathers, and Football Fred, ready to play with full pads, helmet and football. WEBCO and KING began 2003 by returning to tradition with the production of a Scuba Diving Duo, i.e., Shultz and Dooley dressed up in scuba gear as they had appeared in a 1961 Utica Club TV commercial. That year also saw what turned out to be the final German-made stein in the series, a U.S. Marine named Lt. Brewer, later renamed simply “Marine”, which was to become the first in a multi-service group of military characters, but the last of the S&D steins made by KING. In search of lower wholesale prices, WEBCO turned in 2004 to the Far East and began importing steins from Chinese manufacturer Xiamen Jianfa Art Ceramic Co. Ltd. The first of these took another look back at the original Schultz and Dooley in the form of the two characters back-to-back on a single stein in celebration of the Schulz & Dooley 45th Anniversary. The entire production run of 5,000 copies was given a special bottom mark which, in addition to replacing “Made in Germany” with “Made in China” and providing a new web site address, was headed with the words “Commemorative Edition” (Figure 8). That same information has been provided on the bases of all subsequent Schultz and Dooley characters, but replacing the “Commemorative Edition” heading with “First Edition” or deleting the heading completely, as appropriate. In 2005, the series again turned nostalgic with the introduction of the Parrot, a character featured in a 1964 commercial, and the only one of the original “Schultz & Dooley Players” that wasn't a talking beer stein. That same year saw the introduction of an Army character, the second in a group of four military characters which now also includes both Navy and Air Force representatives. As this is written in early 2009, other currently available characters initially manufactured in China include a Hockey Player, a UC Man, complete with a can of Utica Club beer sticking out of his pocket, a Snowmobile stein in four different colors, a Chef and a Hunter. It’s worth noting that all of the Chinese-made characters subsequent to the Parrot were designed to allow buyers the option of personalization in the form of a name badge and, consequently, the practice of giving characters personal names (like “Officer Sudds” and “Rod Lager”) has apparently been abandoned in favor of the more generic designations. Literally hundreds of thousands of Schultz and Dooley series characters have now reached the marketplace, leaving little room for doubt regarding their continuing popularity with collectors. That popularity, of course, is likely to translate over time into significant price appreciation, particularly for “first issues,” thereby meeting at least one of the major criteria for becoming “serious” collectibles. My sense of the marketplace, however, is that many collectors, myself included, have acquired them for reasons other than the promise of profits. Although generally unrecognized by collectors, the original Schultz and Dooley steins hold a place in steinmaking history, in that they were in all probability the very first character steins produced specifically for an American audience. By comparison, the original “Bud Man,” Anheuser-Busch’s initial character stein, did not arrive on the scene until 1976, some 17 years later. Moreover, the on-going series of companion steins is in itself a likely first in the history of steinmaking. Although there are several groups of character steins that might qualify as “sets,” there has never before been anything to compare in scope or staying power with the Schultz and Dooley series. Another factor contributing to the popularity of these steins is that there are any number of people for whom Schultz and Dooley help to evoke fond memories of an earlier time in their lives. In a sense, this reaction to Schultz and Dooley is not unlike that of the many servicemen who did tours of duty in Germany and whose memories are recaptured through stein collecting. Finally, the Schultz and Dooley series is just plain fun and also readily obtainable. The cartoon-like nature of the steins is appealing to people of all ages and they’re available at prices almost everyone can afford. As Internet auctions (principally eBay) have begun to clarify the real supply and demand curves for collectible beer steins, many of the previously “hot” sellers (e.g., Anheuser-Busch steins, Corona characters, et al.) have cooled substantially. Interestingly, the same market forces that have beaten down the prices of some of the previous high flyers have had just the opposite impact on the Schultz & Dooley series. Now that the Internet has provided wide-spread access to the early editions of these steins, which not long ago had been limited to collectors in the Northeast, prices in some cases have actually risen substantially. Like most contemporary series collectibles, the Schultz and Dooley steins have, and are likely to continue to appreciate most are the series “firsts.” In that regard, the original Schultz and Dooley have already been “discovered” to some extent, with the pair now selling for as much as 25 to 30 times its original list price. However, it is my personal feeling that they still have a long way to go. Another stein in the series which has already seen significant price appreciation and will likely go even higher over the next few years is Bubbles LaBrew. Given the fact that only 3,000 copies of this stein are marked “1st Edition,” it’s clear that the original Ms. LaBrew holds the key to a “complete” collection of originals. In 1998 the Cousin Emma stein became the first character in the series to be “retired” by WEBCO, at which point prices began to increase at a rate that could only be described as dramatic. Although she had a 1st Edition run of 7,000, auction results consistently indicate that there is sufficient demand to keep her current value well above the initial sale price. Clearly, collectors with a profit motive need to be attuned to series retirements as part of their collecting strategy. The most likely candidate for similar price appreciation in the near term appears to be Farmer Mugee, who was retired in 1999. However, to date the price appreciation has not managed to reach the levels achieved by Cousin Emma. This may be related to the fact that the original Farmer Mugee steins do not bear a “1st Edition” mark but, rather, are distinguishable only by their “Made in Europe Imports” (MIE) logo. As this fact becomes more well known, higher prices can probably be expected. My personal choice for the “sleepers” among the early issue are the Ceramarte versions of Officer Sudds and the Countess, which were both “originals” and had relatively small production runs. It’s possible that secondary market prices for these two steins are suffering from their Brazilian (as opposed to German) origins, but I suspect it’s more likely that, here again, more collectors just need to discover that the Ceramarte versions were the first to be produced. Assuming the series continues to expand, even the original editions from the late eighties and early nineties are likely to see their values rise significantly in the foreseeable future. At least that’s what we’d all like to believe. *This is a revised and updated version of an article that originally appeared in Prosit, the Journal of Stein Collectors International, in March 1996. New content © 1998-2009 Beer Stein Library — All rights reserved.